A two stroke cycle engine or four-stroke cycle engine is commonly used in the automobile industry to convert petrol or diesel into useful work. Many of us use motorbike or car for traveling purpose. How much you know about the engine and its working? Those who are from mechanical engineering or automobile engineering field may familiar with working principle of two-stroke engine or four-stroke cycle engine. Mostly common man is unfamiliar working with the engine. So, here I will like to share the information on advantages and disadvantages of two-stroke cycle engine. 01) Two stroke cycle engine is more compact, requires less space and lighter in weight than four-stroke cycle engine for same output or power. The power developed per kilogram of engine weight is higher in two stroke cycle engine. Hence it is more suitable for motorbike and scooters. 02) The two-stroke cycle engine gives one working stroke for each revolution of the crankshaft. Hence theoretically the power developed for the same engine speed and cylinder volume is twice as that of four-stroke cycle engine which gives one working stroke for every two revolutions of the crankshaft. 03) We can use lighter flywheel in two stroke cycle engine as there is one working stroke for each revolution of the crankshaft. 04) The design and construction are much simpler than a four-stroke engine that’s why it is easy to manufacture and cost-effective. 05) As there is no suction and exhaust valve used in two-stroke cycle engine hence no need for cams, camshaft and rockers etc. of the valve gear, which in Result produce higher mechanical efficiency. 06) Due to two suction and exhaust ports only, there is work saved avoiding friction. 07) Two stroke cycle engine gives fewer torsion oscillations. 08) Also, this type of engine requires less spare parts. 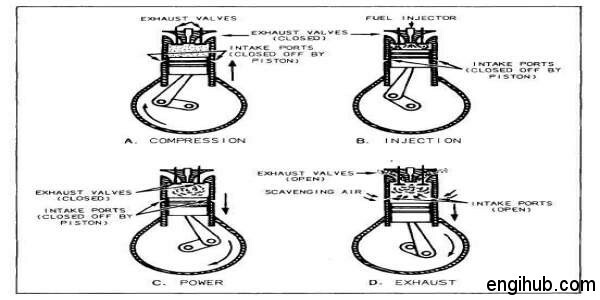 09) A two-stroke cycle engine can be easily reversed if it is of valveless type. 10) Due to simplicity in construction and fewer parts, two-stroke cycle engines are easy for maintenance. Hence reduce the initial and maintenance cost also. 01) The fuel consumption is higher in a case of a two-stroke engine working on Otto cycle. This happens due to some of the fuel or un-burnt gas likely to be wasted by escaping through the exhaust port. 02) Since the ports remain open during up word stroke, the actual compression starts only after both inlet and exhaust ports have been closed. Hence actual compression ratio and thermal efficiency of two stroke cycle engine are less than that of a four-stroke engine of the same dimension. 03) The dilution of charges takes place due to incomplete scavenging. 04) Also, two stroke engine consumes more lube oil. 05) There are greater wear and tear of moving parts hence it gives loud noise.